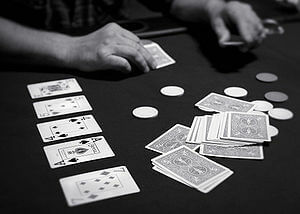 2012 has been an extremely interesting year for poker players, and with four months left on the calendar we still have plenty of news to be made. In this column I’ll take a look at the five biggest stories of 2012 up to this point. There were a lot of memorable moments at the 2012 WSOP (Phil Ivey, Phil Hellmuth, Vanessa Selbst, and David ODB Baker come to mind right away) but perhaps the most memorable performance came in the Main Event when Elisabeth Hille and Gaelle Baumann made the two deepest runs by a woman in the Main Event since Annie Duke in 2000. Hille finished in 11th place while Baumann matched Duke’s 10th place finish, nearly making the final table of the event, which would have made her only the second women to do so, joining Barbara Enright who finished 5th in 1995. Online poker in the US is becoming a reality, but unfortunately it’s only the state of Nevada that is close to launching a real-money online poker room –c’mon federal government ONE TIME! It appears that South Point Casino (one of four entities to receive a license from the NGCB so far) is the closest to launching, with an official launch date planned for sometime in October. A recent ruling by Federal District Judge Jack Weinstein ruled that poker is a game of skill, possibly changing the legal landscape and accelerating online poker legislation in the US — c’mon federal government ONE TIME! The ruling is the first of its kind that differentiates poker from games of chance like roulette, and even if it doesn’t lead to legal online poker is still a pretty good moral victory for poker players. Perhaps no poker tournament has ever captured the attention of the entire poker world like the $1,000,000 buy-in Big One for One Drop tournament organized by Guy Laliberte. The tournament exceeded expectations all the way around, reaching the 48 player cap, as well as seeing a satellite tournament held the night before handout not one, but two seats into the tournament –with the tournament already capped Shaun Deeb was the lucky recipient of a cool $1 million in cash! The tournament itself was won by Antonio Esfandiari who defeated Sam Trickett heads-up for the title, with the two players winning over $28 million between them! If stories are judged by their ability to crash the 2+2 servers than Black Friday was the biggest story of 2011. And it goes without saying that the deal that saw Full Tilt poker sold to PokerStars with player repayments as part of the process was easily the biggest news in poker in 2012. Players are now just in an uncomfortable waiting period while they await their Full Tilt Poker money over a year after last seeing it.